An interview with VIMS professor Mary Fabrizio concerning blue catfish in Virginia highlights a recent segment of Richmond Public Radio’s Open Source news show. The interview, which aired on March 9, is available for online listening or download at http://bit.ly/vimswrir. Fabrizio’s 20-minute interview with host Will Snyder begins at the 20-minute mark of the online podcast. Fabrizio, head of the Juvenile Fish and Blue Crab Trawl Survey at VIMS, has been studying blue catfish for the last several years. The non-native species was introduced into Virginia’s tidal rivers in the mid-1970s and has since increased greatly in abundance and expanded its range into saltier waters downstream. The fish, which can exceed 100 pounds, are now considered the top predators in the James River, with unknown impacts on the waterway and its other organisms. Fabrizio is working with colleagues at VIMS, Virginia Commonwealth University, the Virginia Department of Game and Inland Fisheries, and Maryland’s Department of Natural Resources to monitor the changing abundance and distribution of blue catfish in Chesapeake Bay tributaries, and to better understand how the fish is impacting local ecosystems. The ultimate goal of their research is to provide a scientific basis for management decisions concerning the species and its recreational fishery. Blue catfish are widely sought by trophy anglers in the Commonwealth, with the current state record a 143-pound blue catfish caught in 2011 in Buggs Island Lake in south central Virginia (also the world record). 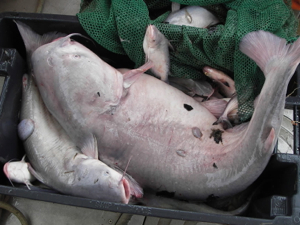 The largest blue cat from the James River is a 102-pound, 52-inch fish caught in 2009 near Richmond. During the interview, Fabrizio answers questions about the introduction of the species, its current abundance and distribution, its safety as a seafood item, and its surprising ability to survive in waters that were once thought too salty for this normally freshwater species. One area of particular concern is the possible interaction between blue catfish and American shad, a troubled native species that is the focus of significant restoration efforts in the James River and other Chesapeake Bay tributaries. There is evidence that blue catfish feed on shad, as well as other forage species such as river herring and menhaden that have traditionally supported populations of striped bass, bluefish, summer flounder, and other native fish. Open Source, the anchor news talk program for WRIR Richmond Public Radio, is a 1-hour, live talk show that airs every Friday at 10am on 97.3 FM WRIR. The broadcast analyzes regional news, politics, and culture with in-studio guests and listener questions. Open Source is hosted by Will Snyder, a former columnist for the Wall Street Journal magazine and a writer for the Wall Street Journal.